I know you can’t always believe what a company says about itself or its service, so I don’t want you to take my word that we’re the best. I can tend to be biased. But you certainly can believe what my clients have to say. 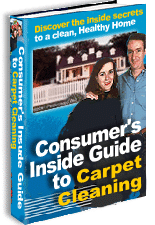 I have hundreds of more-than-satisfied clients who would NEVER allow any other carpet cleaning company in their home. There are comments from over 200 clients on this page. If you live in my service area, you’re sure to know some of them. Take a little time to see what they have to say about my company and my service. P.S. – All references are available upon request.